Introduction. Restructuring electricity systems in transition (L. Mez et al.). Regulation beyond market and hierarchy: an excursion into regulation theory (A. Midttun). Varieties of Liberal Reform. The British market reform: a centralistic capitalist approach (S. Thomas). The Norwegian, Swedish and Finnish reforms: competitive public capitalism and the emergence of the Nordic internal market (A. Midttun). Systems in Negotiated Transition. Energy efficiency and the political economy of the Danish electricity system (F. Hvelplund). The Dutch electricity reform: reorganisation by negotiation (M.J. Arentsen et al.). Public Service Oriented and Cartellised Monopolies. The French electricity regime (M. Poppe, L. Cauret). The German electricity reform attempts: reforming co-optive networks (L. Mez). Comparative Analysis. Electricity policy within the European Union: one step forward, two steps back (A. Midttun). Regulation paradigms and regulation practice: a comparative review (A. Midttun). The politics of electricity regulation (L. Mez, A. Midttun). The electricity generation and supply industry is undergoing rapid changes in the 1990s. As demands for economic power continue to increase, governments throughout Europe are contemplating a reformation of electricity policy for the 21st century. This book discusses the current state of the European electricity generation and supply industry and the options for improvement in the future. Written by renowned experts in the field of energy policy and economics, the book includes detailed case studies of national electricity regulation from around Europe, and a timely overview of European Union electricity policy on liberalisation and deregulation. 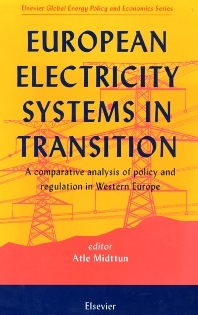 Given that the changes to the European electricity industries will provide valuable pointers to change in other areas, this book is essential reading for industry analysts, policy makers, utility companies and others with an interest in the future of energy generation and transmission worldwide. For electricity industry analysts, policy makers, utility companies and anyone with an interest in energy policy and economics. @qu:...is a good book for those interested in delving deeper into the political rationale behind Europe's power reforms. @source:Energy Economist @qu:This is a wide ranging and informative book about progress towards liberal markets in electricity in the EU. The theoretical framework gives it a strong intellectual coherence - Midttun is an economic sociologist - and the individual chapters contain a wealth of country detail. This book is an authoritative source of country information on the period immediately leading up to the implementation of the EU Electricity Directive. The chapters on Denmark, Netherlands, France and the EU are particularly valuable because of the relative lack of good analysis (in English) of electricity industry developments in these states.